For those who live in the northern hemisphere, it is now summer time, which translates to spending plenty of time outdoors in order to take in as much heat as possible while shaking off the winter and spring blues. However, some of us might forget about the dangers of being out and under the sun for too long, so much so that we get dehydrated. 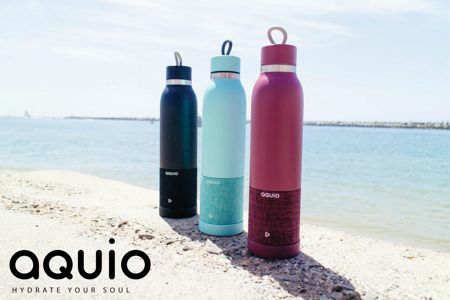 Aquio has just the thing for you with a twist: their range of premium double-wall stainless-steel hydration bottles will arrive in a wide range of designer colors while boasting of an integrated, modular waterproof Bluetooth speaker that is powered by iHome, making this truly one of a kind in its class. In addition, Aquio will ensure that drinks are kept ice cold for up to 24 hours, and for those who prefer to enjoy a steaming hot cuppa, you can do so for up to 14 hours. Proudly designed in the USA, Aquio is manufactured using high-quality stainless steel that is BPA-free for added peace of mind. It will arrive in midnight, seafoam, merlot and blush shades, making it the perfect hydration bottle for those who lead an active lifestyle as well as enjoy bringing their favorite tunes with them wherever they go. The removable speaker on the Aquio might be small but powerful, as this IP67-rated device is waterproof, sandproof, and boasts of designer weather-resistant acoustic fabric. With a double-wall insulated stainless steel design and a wide mouth twist-off lid that makes for comfortable drinking, one can also throw in ice cubes in a jiffy while cleaning is an easy task. The modular 5-watt (RMS) Bluetooth speaker comes with digital echo cancellation alongside a talk/end button for its speakerphone function, ensuring that you do not miss a single incoming call even when you are partying outside. Expect the Aquio to begin to go on sale from early next month onwards for $69.99 apiece.